Vintage Metlox Poppytrail California Ivy console bowl. 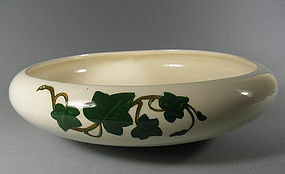 The hand painted ivy pattern repeats around the bowl 3 times. In excellent condition, it measures 11 inches across and 3 inches high.